October 20, 2017 – PRP Follicular regeneration has emerged as a new treatment to hair loss. What exactly is PRP Follicular Regeneration? In treatments, patient’s are able to use their own blood platelets to effectively stimulate hair growth, safely and naturally. Based on a study conducted by plastic surgeons, biologists, pathologists of the University of Rome “Tor Vergata,” and a dermatologist of the Catholic University of the Sacred Heart of Rome, their data clearly proved that patients presented clinical improvement in the mean number of hairs, after treatment. The study proved the positive effects of PRP injections on Androgenic alopecia, or male/female pattern hair loss, without major side effects. 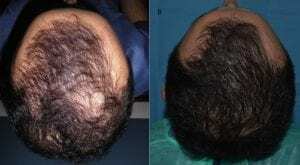 An example from the study showing the hair growth due to treatment. How does PRP Follicular Regneration work? According to National Hair Center: First, blood is drawn from the patient in the same manner as a routine blood test. The blood is then spun in a centrifuge and platelet rich plasma (PRP) is separated from the rest of the blood. The separated platelets are highly concentrated with protein and growth factors that are used to regenerate the hair follicles and scalp tissue. The PRP solution is then applied using a special micro-pen with 12 tiny micro-needles into the upper skin levels of the scalp and is virtually painless. The initial treatment requires less than an hour to perform. For most patients, an additional two treatments are recommended to enhance the regeneration. And it begins to work after one to two sessions. This has been a ground breaking scientific discovery for treating hair loss.